Exactly one month today I’ll be settling into my new home: the University of East Anglia. 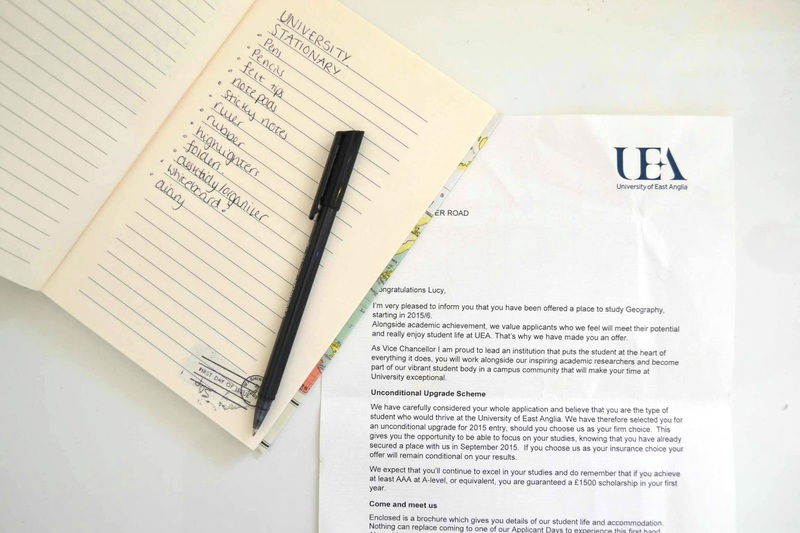 I’m attending UEA for 3 years to study Geography. University is something I’ve always had my heart on. I love to learn and be in a learning environment, and the social aspects have always appealed to me just as much. They always say university will be the best years of your life. Despite it being a scary process, I know it’s the right thing for me and this time in 3 years I’ll be grateful to have done it, with hundreds of memories and new life experience learnt. Thankfully UEA isn’t far from my hometown, Ipswich. It’s far enough away for me to feel independent but close enough for me to jump on a train when I need a mummy cuddle or a proper homemade meal. Nonetheless, it’s still a very daunting thing for me. I’ll be living on my own for the first time with complete independence, some of which I haven’t yet gained! I’ll be leaving my family, my friends and my boyfriend and made to make new ones. I’m excited to meet new people and start new adventures, building both my experiences and myself as a person. Did you go to uni? Do you have any tips for me?